Lightweight Grass Reinforcement Mesh of 450g per square metre is suitable for strengthening embankments, creating better access for wheelchairs, buggies, cleaner pedestrian access or to prevent animals digging etc. The grades of 650g per m2 to 1000g per m2 are suitable for occasional vehicle parking. For heavier vehicles or more frequent use choose a heavier grade of mesh of 1250g to 2000g per square metre (look at the weight per m2 as means of comparing different products). 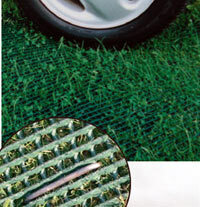 Grass Protection Mesh can be installed at any time of year but the time when it can take the maximum load can be reduced by laying it when the grass is actively growing.